The fascination for the Rubik’s Cube is something that spans generations and cultures. I do not think that it will go away any time soon. Whether you think of the actual cube which you can play with (more like make you want to tear your hair out in frustration), or you think of other items made in the likeness of the Rubik’s Cube, the effect is the same. People are drawn to this timeless puzzle. I have seen a Rubik’s cube post-it, a Rubik’s cube made out of “brain”, and so much more. This recent discovery adds to the already long list of Rubik’s Cube-related items: a chest of drawers that looks exactly like that little cube children and adults play with. 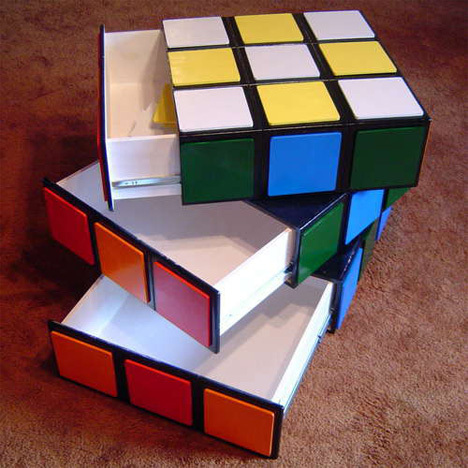 Not only does the chest of drawers look like the Rubik’s Cube, but it also spins – maybe not exactly like the real puzzle, but it does spin on a central axis, which is rather understandable as the piece of furniture was meant to be used as well. In order to achieve this, the builder used lazy susans. Simple solution but brilliant, isn’t it? 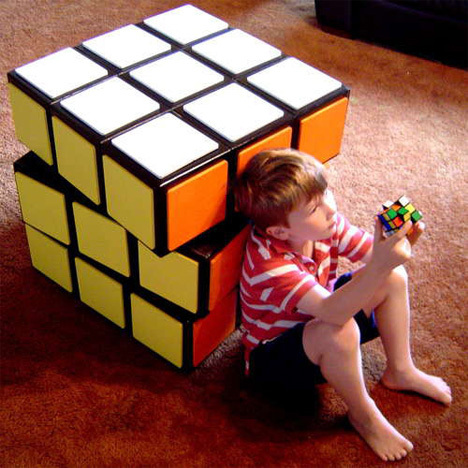 To give you an idea of the size of this Rubik’s Cube chest of drawers, take a look at this adorable photo. Want to make your own? I am sure that with a little DIY skill, you can have one in a short period of time. It may not be done in time for Christmas, but it should be worth the wait. Check out Makendo’s complete instructions.